These printable puzzles are short, self-checking vocabulary or reading exercises. Kids cut the scrambled puzzle apart. Then, they match the words on the pictures to the spaces on the board and glue down the squares. If they have the right answers, the squares will be in the right places to make the picture. The picture helps sort out the answers they are not sure of. You can use these puzzles with any content. When I can, I use a picture that relates to the content, but that is not essential. For example, of the puzzles I included below, two of the puzzles use simple sentences about the picture, but the other is just matching number words to numerals. I have included a blank puzzle and board so you can make your own by writing in whatever you are working on. These are the sentences used in my tortuga puzzle. The verbs for each sentence are on the scrambled picture. 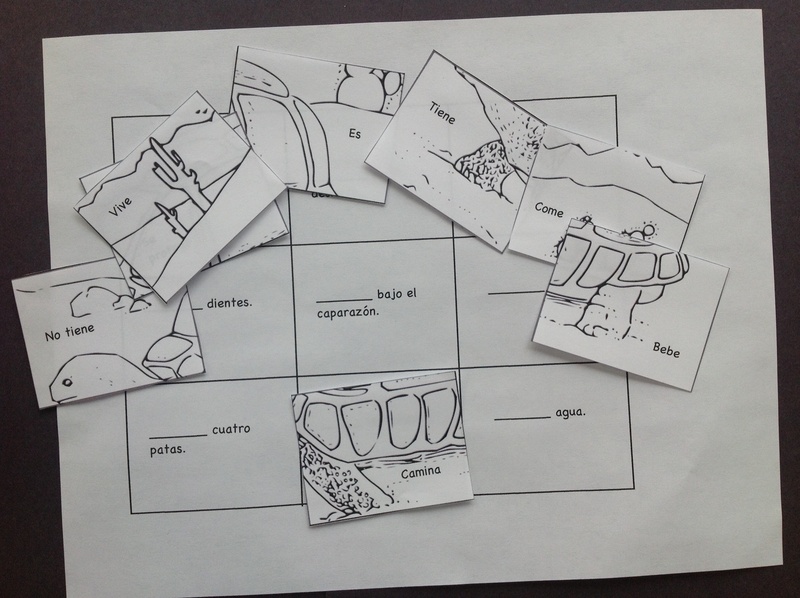 Kids use the verbs to complete the sentence and place the square in the right place. The sentences refer to the picture, which is a desert tortoise (not all tortugas live in the desert). Se protege bajo el caparazón. Wow, I’ve never seen these before but they are fantastic! Thanks for putting them up – if you have any more I’d love to see them! I do have more scrambled pictures and boards. One is a house and one is sunflowers and a fence. I make them from public domain coloring pages. The vocabulary on those puzzles is pretty specific to what we were doing (stories we had read), but I can post the blank scrambled puzzles and the boards. You can write in any kind of content to be matched. They work really well for math problems! Just remember to put the shorter text, if there is a difference, on the picture so it doesn’t interfere as much with the image. I’ll put the others up; it will probably be tomorrow. Awesome , they are good this will helps a lot to the students in my class, love it.